One of the ways I keep organized is that I take lots of notes. Maybe it’s a holdover from the many years I spent in grad school, maybe it’s because I like to be able to refer back to things and see how far my characters have come. Whatever the reason, note-taking is a part of my game playing, for both the tabletop games and LARPs I’m in. Ëlinyr’s never without her notebook! 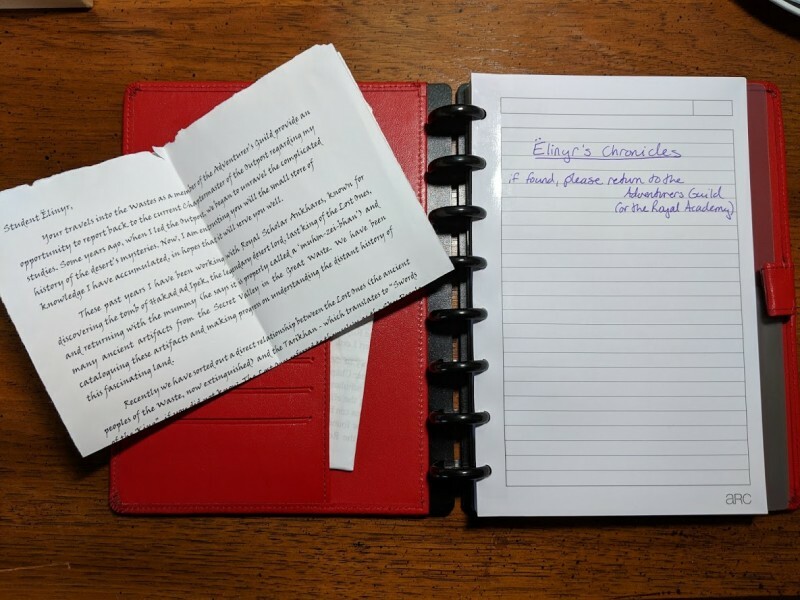 When it comes to Kishar, note taking is a big part of Ëlinyr’s character, given that she’s a scholar – she’s always seen taking notes in her red notebook. This also helps me remember what happened in the game, which in turn helps out other characters. I often get asked “hey, do you have notes about this thing that happened three games ago and turned out to be really important?” In fact, Ëlinyr’s almost-excessive note-taking ended up helping her get a position as the Chief Archivist of House Lacewing, in addition to her teaching role at The Royal Academy. Ëlinyr’s notebook, filled with lots of important Kishar plot notes! I use a red Arc notebook from Staples for Ëlinyr’s notes – this way, I can add/remove pages as I need to, and it’s also got a pen loop! The previous journal I was using for Ëlinyr didn’t have one, and I kept having to fish around for a pen whenever I needed to take notes – which was frustrating. Taking quick notes is important at Kishar, and if I’m having to rummage through a bag full of spell packets to find a pen, I’m either going to miss something important or forget what I wanted to write down. That pen loop is a life-saver! In addition to holding pens, the notebook has a pocket at the front which I use to hold letters Ëlinyr receives in game. In the Blue Rose game I play in, I take notes more to keep track of what’s going on and really help me focus on the game. 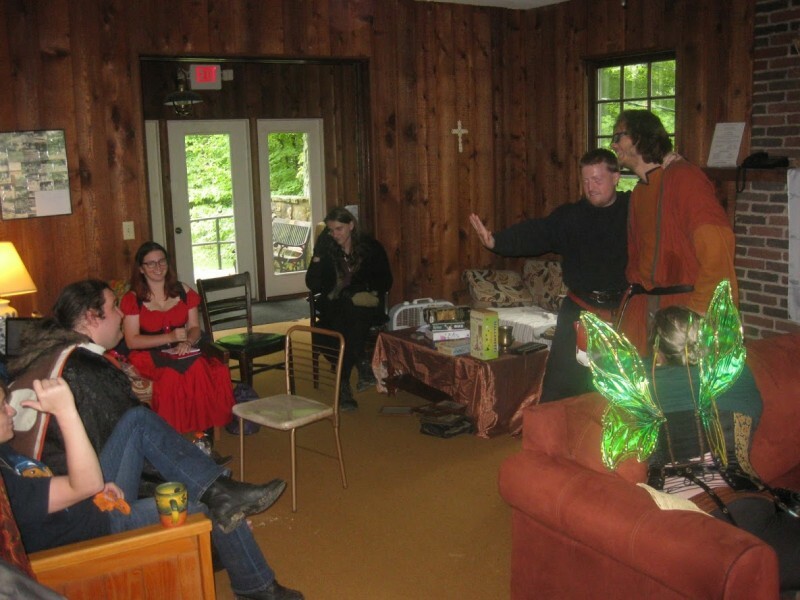 Plus, the other players find it helpful that I take notes – however, maybe I shouldn’t have chosen to play a bard for the Blue Rose game, as sometimes I end up having to write and talk at the same time, and that never ends well, haha. Also, the notes I take for Blue Rose aren’t nearly as detailed as the ones I take for Kishar – sometimes it’s just a few important tidbits that might be relevant further down the line. My Blue Rose notes are contained in a binder, along with other things I want to have on hand during the game. I have everything organized by section, and it helps me find things easily. Which brings me to my next organizational tool: keeping everything together! Keeping everything together for a specific game really helps me out, so I’m not hunting things down at the last minute. 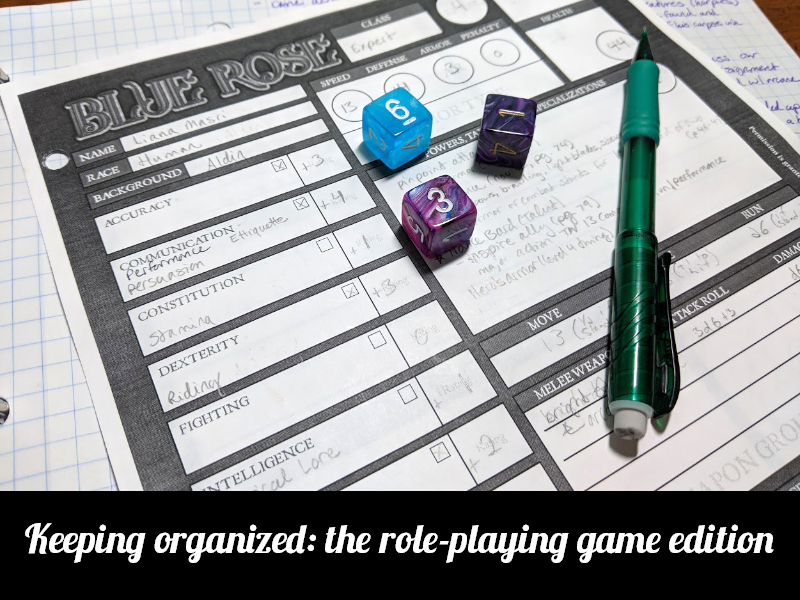 It’s really easy for me to forget things (for example, those pesky Blue Rose character sheets I mentioned earlier), and if I can manage to keep everything together, it makes it easier for me – and for my fellow players, too, who don’t have to wait while I try to figure out if I remembered something or not. 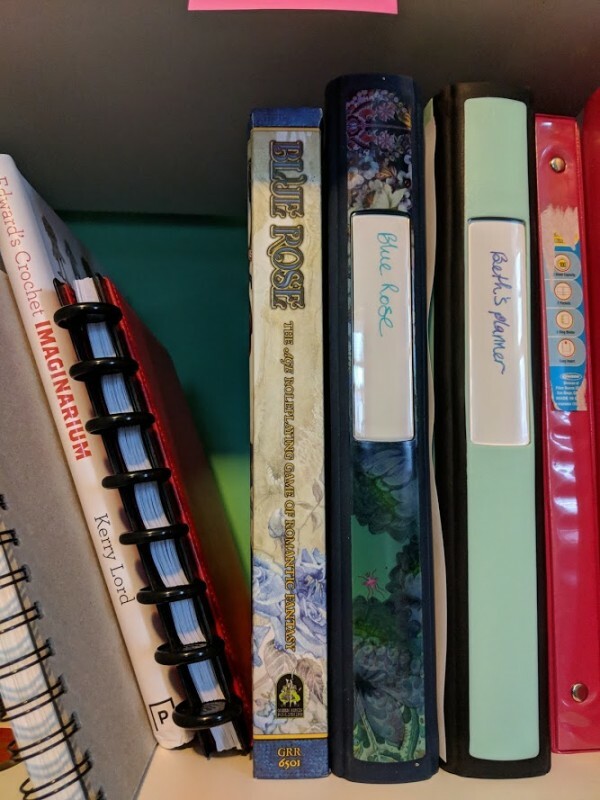 As I mentioned earlier, for Blue Rose, I keep all my game stuff (notes, character sheets, and between-game stories) in a binder next to my Blue Rose players guide in a shelf on my desk. That way, I can quickly grab everything and pack it up. I’ve also got something similar for my Pathfinder Society characters – they all live in a binder, along with any notes for their associated campaigns. I try to keep my dice bag nearby, so I can remember to grab that too. If I forget to bring them, though, I’ve got spare dice in my car! For Kishar, I do something similar to how I keep organized for my tabletop games, but on a larger scale – everything I might possibly need for Ëlinyr, including her journal, lives inside a big plastic tote that I can just pick up and toss in the car. It eliminates me wondering if I remembered to bring appropriate shoes, or panicking because my spell packets are in a bag in the garage and not with the rest of my stuff. Some of my organization tools aren’t just for my benefit, though. To help keep my fellow players organized, I’m working on a wiki for the Blue Rose campaign I’m part of, to help make it easier for us to find information about characters we’ve met and places we’ve been. There’s not much on there right now, but it’s a start! I’m building the wiki using Google Sites, as it’s not very complicated to use and it’s easy to add folks to. Plus, it’s free – which definitely doesn’t hurt. While there are a number of other options out there for building wikis, even some specifically targeted to documenting tabletop role-playing games (like Obsidian Portal), I wanted something easy for everyone to just jump in and use. Since all the players in the Blue Rose game have Google accounts, setting up the wiki in Google Sites seemed like the best idea. The structure for the site is based off a Google doc we’ve all been editing since we started the campaign – we outgrew that google doc a while ago, though, hence the wiki! Take notes! Don’t take so many notes that you’re not able to interact in the game, but take enough so that the next time your game meets, whether it’s in a week or a month, you’ve still got an idea of what happened in the last game. Keep everything for a specific game together. For some games, this might be easily accomplished with a folder or a binder that holds your character sheet and notes, but for games like LARPs, a tote might work best to keep all your costume pieces, weapons, and other assorted props together. Keeping everything together makes it easier for you to get things ready for your next game. Set up a wiki with game information. Setting up a basic wiki for your campaign will help out everyone in the game immensely, not just you. Plus, everyone can help with the editing, and fill in the gaps when others miss some details.